Traveling across the country has never been more enjoyable than in this Prowler travel trailer. With an impressive capacity to sleep ten people, this trailer not only gives you the space for all of your guests to sleep, but it also gives everyone a comfortable place to rest their head each night. The double bunk beds are what the kids will beg to call their own, and you will feel completely relaxed and rejuvenated each morning waking up on the queen-sized bed in the front, private bedroom. Because there have been two entry/exit doors included in this trailer, you can directly enter the rear bathroom whenever you need while you are playing outdoors. As you journey across the country and search for your absolute favorite getaway spots, you will find that the thing you love most about camping is this trailer by Heartland. From the tinted safety glass windows, which will prevent the sun's harmful rays from damaging the interior furnishings, to the LED-lit exterior speakers, which will draw your family outdoors each evening to enjoy the pleasant music they can play, this unit delivers it all. When you do head inside, you will be pleasantly surprised to find vaulted ceilings that will keep the space feeling open and roomy, and you will always be able to confidently travel in this unit because of all of the safety equipment that has been included to prevent unseen emergencies, like the fire extinguisher and the smoke, carbon monoxide, and LP detectors. Weâ€™re committed to providing you with the highest level of service, so youâ€™ll always be happy that you chose us. 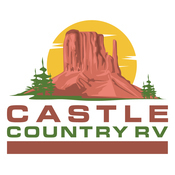 Here at Castle Country RV, we promise to always take care of our customers. We do not just talk about customer service, we live it each day. We pride ourselves on our honesty and integrity and we firmly believe that you'll see the difference when you choose our company. We've also been family- owned and operated from the start. We may not be related, but youâ€™ll feel like weâ€™re family.